You're never to young to start your design career. Ready to feel old? 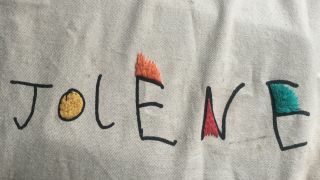 A six-year-old has got his design career off to an early start by creating the logomark for north London restaurant, Jolene. The young designer's distinctive lettering (above) forms the basis of a brand identity brought to life by Studio Frith. Before you despair that this little boy has got a significant head start on your own graphic design career, don't fret. It's worth keeping in mind that he has close connections to the studio, being the son of Studio Frith founder, Frith Kerr. With the creative team looking for a logo design that expressed the restaurant's naive simplicity, Kerr's six-year-old son was the perfect choice to scribble down some unrestrained and imaginative lettering. And when you consider that Jolene promotes sustainable farming methods to preserve the soil for future generations, the decision to use a child's lettering makes total sense. Check out the logo in action by clicking left to right in the gallery below. How's that for a kid's menu? "The logotype's unfinished temperament, plays on the aesthetic of the restaurant itself, with its rough-hewn plaster walls, warm ambient lighting and simple bentwood chairs," the studio told Dezeen. The young designer went through various iterations of the handwritten logo before the final version was chosen. Kerr explained that she selected the logomark based on its "inimitable spacing and crescendo of elegant sans-serif capital letterforms." Thanks to its idiosyncrasies, the logo design also lends itself well to subtle variations of shape and colour to keep the brand looking fresh and exciting. It already exists in different forms, including a piece of curtain embroidery and a rough stamp on a menu. We reached out to the young designer for a comment on how he created the logomark, but was informed he's currently busy at school.